You can change the display of your cart contents from the cart details page. Add and remove cart columns by clicking the Add/remove columns button above the title grid. This will expand a list of all possible columns, presented as buttons. Blue buttons are columns that are currently displayed, and white buttons are columns that are currently hidden. Click a button to add or remove that column. Expand and collapse columns by pulling the sides of the column headers. Rearrange columns by dragging and dropping the column headers. 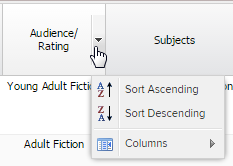 Sort contents by scrolling over a column header and clicking the arrow, then choosing Sort Ascending or Sort Descending. Navigate through carts with multiple pages using the arrows above the carts, or enter a page number in the "Page" box to jump directly to that page. 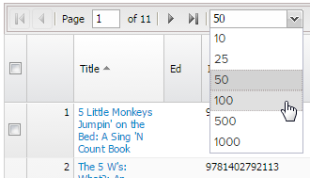 Change the number of titles displayed per page using the drop-down menu to the right of the page numbers.